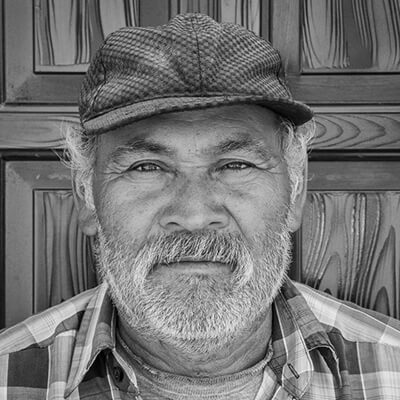 Also known as “Don Beto”, Alberto Ortiz produces mezcals for a number of brands including Los Danzantes, Marca Negra, Donaji, Los Cuerudoes, Yuu Baal, and his exclusive brand Papadiablo. His mezcals typically are wood-roasted in a stone horno, mallet-crushed (by hand), then fermented with wild yeasts, and double-distilled on a 200-liter copper potstill. Don Beto is known for keeping his distillery meticulously clean, which is reflected in his mezcals. He crushes with wood mallets, instead of a mill, to keep horses out of the distillery. It takes three members of his team fourteen hours to crush enough roasted agave to fill one fermentation tank. It is said that yeasts like hand-crushed agaves because it results in a more complete, more complex fermentation.